Continue to Fill out and update your profiles. Remember this site is going to be up for years into the future so continue to revisit to find out what your classmates have been doing for the last 50 years, now and beyond. Please keep trying to find and get our "Missing Classmates" onto this site. Photos taken at the C.K. 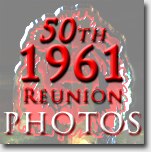 McClatchy Class of 1961 50th Reunion are now available for viewing and purchasing. Toward the upper right corner of the page is a button that says >Slideshow. Click on this to view an automatic slideshow that you can let run, if you wish, like a screensaver. If you wish to purchase a photo, click on the button just above and toward the right of the large photo. This will bring up options to buy prints at various sizes, with choices of photo paper, and even stickers and aprons, etc. You have options to crop photos to fit your needs, as well. Thanks to all who attended the McClatchy Class of '61 50 year reunion! New classmates to this site should click on “Classmate Profiles” above and see if their name is listed on this site. If it is, please click on your name and fill out your profile. If it is not listed, click on “Contact Us” above, fill out your name, email address and other contact information and send to our site administrator as indicated. He will put your name into the site. Thereafter come back to the site, check in and develop your profile. If you can, please send us other classmate names not listed with at least their e-mails and we will proactively list their names. -- Thank You. After you have registered (which is free and secure), click on the Classmate Profiles link on the top left of the page, or below, then click on your name. Let us all know about yourself, your family, travels, your life — whatever you like. In this case, more is better than less, lengthy better than brief. You can even add your own photographs and links to online videos! This site will be here for years to come and you can make changes, additions and modifications any time you want.